South Coast Foam Shapes manufactures light-weight columns with all of the advantages of pre-cast columns without any of the hassles. Installed with adhesive only! We have eliminated the need for mechanical ties to the support post. Can be produced in full, half, or quarter configurations. Short lead times; Three weeks or Less. CAD design offers tremendous flexibility in design. We are not tied to pre-constructed, expensive column molds. Reduced labor cost for installation. 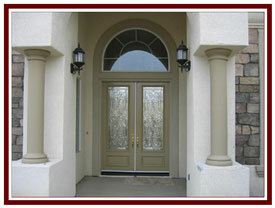 Our columns can be installed typically by one man in typically less than one hour. Contact us today and let us demonstrate how our creative and cost effective column manufacturing process will make your job designs a real snap.